Located beneath the rolling Swiss hills lies the Kaltbach Cave. With its consistent humidity and temperature, this cave has established itself as the perfect ageing space for some of the world’s best cheeses (Kaltbach Le Gruyère AOP or Kaltbach Emmentaler AOP among them). Although the cave wasn’t always used for ageing, recent archaeological evidence reveals local residents have been producing cheese in the region since the Iron Age. Read more about the cave’s history of cheese ageing here. Now, let’s get on to the news. Next time you’re in Wisconsin, keep an eye out for the Curds of Wisconsin food truck (otherwise known as C.O.W.) They’re serving up deep-fried, beer-battered cheese curds, and you might have to fight us for a place in line. Hopefully your favorite wines and cheeses are local. In response to EU subsidies on Airbus, the Trump administration is threatening tariffs on European wine and cheese (and helicopters, but we just care about the important things). Guinness World Records announced a new record for the Greatest Variety of Cheese on a Pizza. Obliterating the previous record of 111, Australian pizzamaker Johnny di Francesco created a pie with 154 different cheeses. Many of us have fond childhood memories of Chuck E. Cheese. The company has been quietly modernizing its menu and offerings, and recently announced it’ll once again be a public company. This recipe promises a (relatively) healthy grilled cheese in under 10 minutes. Not entirely sure what grilled cheese takes MORE than ten minutes, but this one still looks yummy. Vinepair conducted a round up of the world’s most unforgettable cheeses. From the larvae-infested cheese of Sardinia to the donkey’s milk cheese that costs $576 a pound, there’s something to impress every turophile. 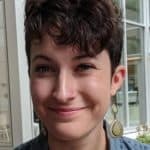 A longtime lover of cheese and wine nights, Madeline finally gets to use her love of cheese in an actual job as Editorial Assistant at Culture Magazine. She lives in Boston.